An international group of researchers performed an in-depth analysis of tumor samples from 56 patients to create the first comprehensive inventory of the genetic, epigenetic, and immune alterations in neurofibromatosis type 1 (NF1) gliomas. They observed that many slow-growing NF1 gliomas may be vulnerable to immunotherapy, which gives the immune system a boost in fighting cancer. An international consortium of researchers has identified a number of specific genetic mutations in neurofibromatosis Type 1 (NF1) gliomas, findings that suggest some of these difficult-to-treat tumors may respond favorably to immunotherapy. Published December 10 in Nature Medicine, the findings reveal for the first time molecular characteristics of high- and low-grade NF1 gliomas, including genetic signatures, expression, and methylation patterns. The research is funded under the Children's Tumor Foundation's Synodos program, a multimillion-dollar initiative focused on the molecular characterization and treatment of NF gliomas. The team was led by Antonio Iavarone, MD, and Anna Lasorella, MD, at Columbia University's Institute for Cancer Genetics in New York. The new study identified 19 new NF1 germline mutations and for the first time compared molecular characteristics of low- and high-grade NF1 gliomas. Several features were discovered that differentiated between the two. Low-grade gliomas are more common in children, while high-grade tumors are typically found in adults with NF1. There were two main age points for gliomas, at 13.5 and 38.8 years, respectively; 77 percent of children developed mostly low-grade tumors while 78 percent of the older patients had high-grade gliomas. “Although there have been many genome studies on other gliomas, this is the first time a study has focused on a specific mutation in NF1 glioma,” said Dr. Lasorella, a professor of pathology and cell biology. “We found that ATRX was the most common mutation in NF1 gliomas. It was frequently converted to homozygosity, and the somatic mutational load of NF1 glioma was influenced by age and grade,” she told Neurology Today. When a predisposing germline mutation converts to homozygosity, it occurs in two rather than just one allele, and therefore exerts more influence. Somatic mutations occur in a single cell and cannot be inherited, while germline mutations can be passed on to children. Mutations in the transcription-regulating protein gene ATRX were uniquely characteristic of high-grade gliomas, making ATRX a potential therapeutic target, Dr. Lasorella said. The ATRX gene provides instructions for normal cell development, and while the specific function of the protein is still unclear, studies suggest it helps regulate the expression of other genes. Previous studies have shown that loss of ATRX increases sensitivity to DNA-damaging agents, and ATRX mutations may therefore represent a point of therapeutic intervention for high-grade NF1 gliomas as well as LGm6 sporadic gliomas that share the same ATRX mutations, according to Dr. Lasorella. “If we treat the aggressive tumors with DNA-damaging agents, we might be able to introduce unsustainable DNA errors that eventually cause cell death and stall the growth of the tumor,” she said. Because ATRX mutations appeared to be responsible for the aggressiveness of NF1 glioma, similar mutational and clinical features of the sporadic glioma counterpart (LGm6) needs to be reevaluated, a result that could lead to a more accurate classification of sporadic tumors, she said, adding that examination of other NF1-associated neoplasms with sporadic counterparts could reveal distinct pathogenic mechanisms that might have therapeutic implications. Although aggressive NF1 tumors were packed with macrophages and are likely to resist immunotherapy, low-grade tumors had abundant infiltrates of activated T lymphocytes and mutation-derived neoantigens. The study also discovered that a subgroup of brain tumors in patients without NF1 share the same molecular profile as the slow-growing NF1 gliomas. Future studies will have to establish whether these NF1 glioma-like brain tumors also exhibit the same immune features and are potentially vulnerable to immunotherapy, she said. The researchers analyzed glioma grades throughout the lifespan of 56 NF1 patients using 59 glioma tumor tissue samples removed during surgical resection. The group included 22 children between the ages of 2 and 15, and 33 adults, as well as one patient whose age was not available. Gliomas were classified as low-grade (59 percent) and high-grade (41 percent). Whole exome sequencing was performed for the 59 NF1 glioma samples and the results were matched with blood DNA from 43 patients to determine germline and somatic mutations, including single nucleotide variants (SNVs), small insertions, as well as deletions. Because most NF1 patients do not undergo brain surgery, the researchers noted that the sample represented a specific subset of tumors. “It is important to consider that the inaccessible brain tumor location, the relatively benign behavior of brain lesions, the comorbidities, and the neurological deterioration associated with surgical intervention most frequently argue against surgery as choice of treatment for glioma patients with NF1,” the researchers noted. However, analyzing the tumor tissue of each single patient is the only way to understand the biology of the distinct tumor and design personalized effective therapies. In 2016 the World Health Organization (WHO) for the first time classified gliomas into subtypes based on molecular biomarkers, and the new research shows that molecular rather than pathological differences dictate NF1 glioma aggressiveness, noted Jaishri O. Blakeley, MD, professor of neurology, neurosurgery, and oncology and the Marjorie Bloomberg Tiven professor of neurofibromatosis at Johns Hopkins University School of Medicine in Baltimore. “Gliomas are the most common metastatic brain tumors in the population overall, but NF1 gliomas are rare, and their behavior has been until now mysterious,” she told Neurology Today. This is important not only for better prognosis of patients with gliomas, but also to differentiate between NF1 patients who are likely to develop glioma and those who are not, she said. Because of this, being able to collect a large sample of tumors and blood from individual patients of different ages makes these new findings very significant, she added. Studies led by Dr. Gutmann using experimental models of NF1 optic glioma previously demonstrated that T cells are critical for tumor formation and growth. Importantly, T cells educate microglia to produce the growth factors necessary for mouse low-grade glioma expansion, he explained. “The findings reported in this new study highlight the importance of T cells to low-grade gliomas in people with NF1, and provide additional support for future immunotherapy approaches,” he told Neurology Today. “While more research is clearly required, it is possible that novel treatments that target T cells or microglia might emerge as viable treatment options for childhood brain tumors within the next five years,” said Dr. Gutmann. •. D'Angelo F, Ceccarelli M, Garofan L, et al The molecular landscape of glioma in patients with neurofibromatosis 1 https://www.nature.com/articles/s41591-018-0263-8. Nature Med 2018; Epub 2018 Dec 10. •. Pan Y, Xiong M, Chen R, et al Athymic mice reveal a requirement for T-cell microglia interactions in establishing a microenvironment supportive of NF1 low-grade glioma growth http://genesdev.cshlp.org/content/32/7-8/491.long. Genes Dev 2018;32:491–496. 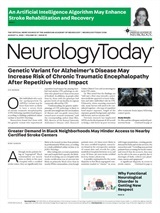 Neurology Today19(3):26-27, February 7, 2019.